Charles Dickens, who was born on February 7, 1812, overcame a childhood of hardship to become the most popular Victorian novelist. His books sold in vast numbers on both sides of the Atlantic, and he was one of the most famous people on earth. These images depict the life of Charles Dickens as well as commemorations held on the 200th anniversary of his birth, February 7, 2012. After working as a newspaper reporter, Charles Dickens published his first book at the age of 24. Charles Dickens worked as a newspaper reporter after a difficult childhood which included time spent toiling in a dismal shoe polish factory when his father had been confined to a debtors' prison. 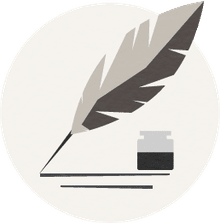 Seeking a career as a writer, Dickens began writing short pieces about life in London, and his first book, Sketches By Boz was published in 1836, when Dickens was 24 years old. This particular portrait depicts Dickens as a dashing young author in 1839, when he would have been 27 years old. Dickens signed his earliest literary efforts as "Boz"
When short pieces Dickens had written for magazines were collected as a book, the artist George Cruikshank created illustrations for Sketches By Boz. The frontispiece, shown here, depicted a crowd waving to men in a hot air balloon. Cruikshank would also illustrate Dickens's first novel, The Pickwick Papers. Dickens began a tradition of working closely with illustrators. Charles Dickens would sometimes pose for photographers as if writing. 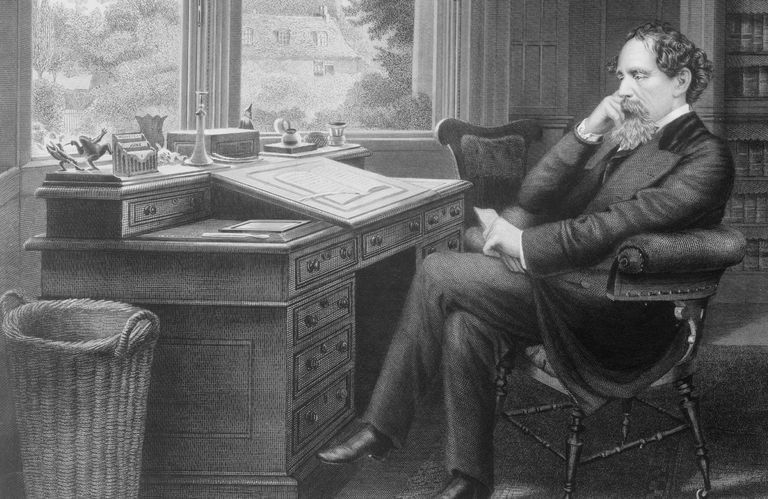 Charles Dickens put in very long hours of writing. At one point, he was actually writing two novels, The Pickwick Papers and Oliver Twist at the same time. His novels were written in a very disciplined handwriting. Because his novels were published as serials, with a chapter being published each month, he could not go back and revise his work. And the deadline were strict, as printers needed to get his copy on time in order to publish on schedule. The concentration required to write his elaborate novels under such conditions is difficult to comprehend. Illustrations in A Christmas Carol reinforced the tone of the book. Charles Dickens considered illustrations to his books important, and he would take an active role in recruiting artists and making sure their artwork was appropriate to his intentions. When Dickens wrote and published A Christmas Carol in late 1843, he worked with the artist John Leech, who provided illustrations depicting scenes from the story. This particular plate was captioned "Scrooge's Third Visitor." In the illustration one of the ghosts who will teach Scrooge about Christmas, the Ghost of Christmas Present, is inviting Scrooge to join him. Dickens Was One of the Most Famous People In the World. In the 1850s, Charles Dickens was one of the most famous people in the world. At that time, the printing technology did not exist to print photographs in popular publications, but engravings could be printed in illustrated magazines and newspapers. Engravings such as this would have made Dickens a familiar figure to the millions of people who read his novels. Charles Dickens would often read onstage and the public would clamor to see him. The author had always been obsessed with the theater. And while he did not follow through on youthful ambitions to become an actor, he did achieve his own success onstage. Throughout his career he would appear before crowds and read from his works. This illustration depicts a crowd at Steinway Hall in New York City purchasing tickets for an appearance on his American tour in 1867. In his youth he had considered the idea of an acting career. Charles Dickens periodically embarked on tours, and he enjoyed reading from his books in front of live audiences. Newspaper reviews of his readings would note that he would act out the parts of some characters. The people in the audience, who had probably already read the books from which Dickens was reading, would be gripped by his performances. The audiences would be convulsed in laughter during comical passages, and would become quite emotional as Dickens read, or essentially acted out, dramatic scenes. This illustration of Dickens reading appeared in Harper's Weekly in 1867, and depicts a performance on his American tour earlier that year. Dickens worked obsessively, aged prematurely, and died at the age of 58. He had overcome a childhood of poverty, and through hard work he had amassed a fortune. Yet he remained obsessive, putting in long hours of work. For diversion, he would routinely go on nightly walks of up to ten miles. But he was made uncomfortable by the idea of not working. By middle-age he began to look much older than he was, and it seemed that the pace of his life had forced him to age prematurely. On June 8, 1870, after spending the day working on the novel The Mystery of Edwin Drood, he suffered a stroke. He died the next day at the age of 58. Dickens was buried in a place of honor at the Poet's Corner of Westminster Abbey. Gillian Anderson showing a rare Dickens edition to Prince Charles and the Duchess of Cornwall. On the 200th anniversary of the birth of Charles Dickens, on February 7, 2012, commemorations were held throughout the United Kingdom. Actress Gillian Anderson, a Dickens fan who has appeared in adaptations of Bleak House and Great Expectations, met with Prince Charles and his wife, Camilla, the Duchess of Cornwall, at the Charles Dickens museum in London. In this photo Ms. Anderson, wearing conservator's gloves, is showing a rare Dickens edition to the royal couple. The 200th anniversary of the birth of Charles Dickens was commemorated at his grave. On the 200th anniversary of the birth of Charles Dickens, on February 7, 2012, dignitaries and members of the Dickens family gathered at his grave to pay tribute to the great Victorian novelist. Gathered at Dicken's grave, in the Poet's Corner of Westminster Abbey in London, were Prince Charles, his wife Camilla, the Duchess of Cornwall, and descendants of Dickens. The actor Ralph Fiennes read an excerpt from Bleak House. On the 200th anniversary of the birth of the great Victorian novelist, Prince Charles placed a wreath on his grave. To commemorate the 200th anniversary of the birth of Charles Dickens, February 7, 2012, Britain's Prince Charles attended a memorial service at Dicken's grave in the Poet's Corner of Westminster Abbey. Representing the nation, Prince Charles placed a wreath of flowers on the novelist's grave. Two descendants of Charles Dickens paid tribute to their illustrious ancestor at his grave in Westminster Abbey. Two descendants of Charles Dickens, his great-great-great-grandson, Rob Charles Dickens, and great-great-great-great-granddaughter, Rachel Dickens Green, attended the memorial service at Westminster Abbey on the novelist's 200th birthday, February 7, 2012. The family members placed flowers on Dicken's grave.